By: Robert H. Sheinberg, D.P.M., F.A.C.F.A.S., D.A.B.F.A.S. 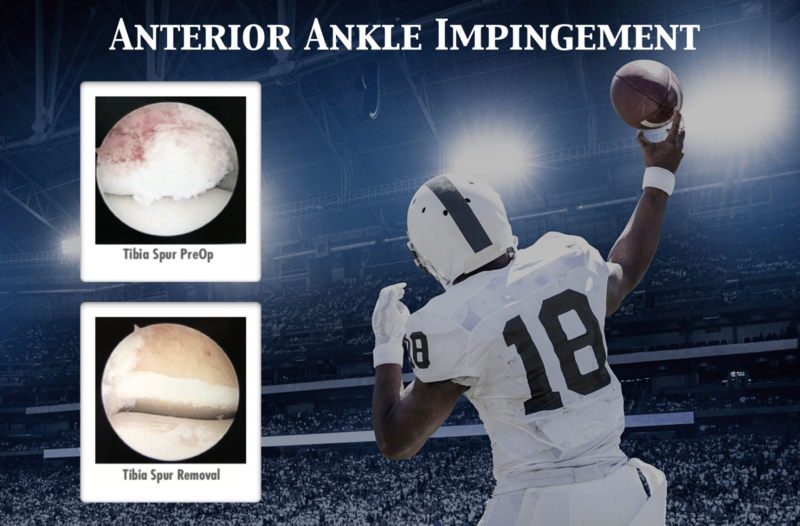 Impingement occurs when bone and/or soft tissue gets caught and compressed between two boney surfaces. In the ankle it is between the tibia and talus. Inflammation, pain, swelling and a loss of motion often develop precluding pain-free sports and general activity. Repetitive jamming of one bone against another causes inflammation of soft tissue and potential for bone spur development. Repetitive trauma to the front of the ankle can cause inflammation and bone spurs. This is very common in soccer players, as the ball is repetitively hitting the front of the ankle and top of the foot. Repetitive stress with the foot in a down position causes pulling of the soft tissue off of the bone. At the bone-tissue interface bleeding occurs, which predisposes to bone spur formation. This is very common in dancers. One or more ankle sprains that causes the ankle to twist down and in (inversion). The talus hits against the inside of the tibia (medial malleolus) causing jamming, swelling and bone spur formation. A history of a fracture in the ankle joint that causes synovitis and thickening of the soft tissue and bone spurs to develop. Bones may be prominent because they heal out of place. First thing in the morning or after arising out of bed the ankle feels excessively stiff. The stiffness is also seen after sitting for a period of time and getting up to walk. This stiffness does diminish as a person weightbears or walks. In some cases the stiffness goes away completely and in other cases the problem has advanced and the stiffness persists. Pain in the front of the ankle with exercises that cause the ankle to move excessively in the up direction (dorsiflexion). Swelling may be mild, moderate or severe in the front of the ankle depending on the degree of deformity. Occasional feeling of instability when walking (feels like the ankle will give out). Thorough history of the injury or if no injury has been present, a history of the pain and stiffness that has developed in the ankle joint. History of activities of daily living and sports enjoyed and what the patient is no longer able to do but would like to do in the future. Evaluation of the patient sitting, standing and walking to see if there are anatomical predispositions to the injury. This can include curvatures of the foot, ankle or lower leg in or out. Evaluation of the ligaments, tendons and muscles to see if there are any areas of instability or weakness. An imbalance can lead to problems. Evaluation of the arch to see if it is excessively high or low, which can cause problems in the inner or outer ankle. X-rays are always taken, which often shows signs of bone spur impingement. Spurs are often seen off of the tibia and/or talus. X-rays also show the contour of the foot and ankle and what may predispose to bone spur development. MRIs may be necessary to evaluate the soft tissue and rule out cartilage injury to the tibia or talus. Bone spurs are also seen. CT scans may be necessary to get a thorough evaluation of the extent of the bone spur formation so that if surgery is necessary an exact approach is taken. Bone spurs in the ankle off the talus and tibia typically do not touch each other when the foot is hyperflexed (dorsiflexion). After a complete history and physical examination and looking at all diagnostic images (x-rays, MRIs and CT scans), a comprehensive treatment plan is given. If mild stiffness, pain and swelling are present, a cortisone injection to the joint will temporarily help. The shot may last for a very short or long period of time depending on many factors. Mild changes in the joint can allow the medicine to work for many months or more than a year. With severe spurring or impingement a shot will not likely last for more than a few days or weeks. Physical therapy will help to improve range of motion, balance, stability, strength and help to reduce pain and inflammation to the joint. Temporary immobilization in a cast or boot if pain is severe and moving the ankle was too difficult or painful. Arthroscopic surgery is an excellent procedure to remove thickened soft tissue and bone spurs from the ankle joint. It is an outpatient procedure performed under a local, twilight or general anesthetic. Two small incisions ¼ inch in length are made in the front part of the ankle. A small camera is inserted into the joint and special shavers with suction are used to remove debris, soft tissue and bone from the joint. Postoperatively bandages are applied for 1 day. The bandages are removed the next day and early range of motion starts. Patients may be weightbearing immediately or may need to be nonweightbearing using crutches for up to 6 weeks. Physical therapy starts within a week to help restore range of motion, strength and stability back to the joint. If spurring and soft tissue thickening is mild to moderate and there is minimal to no arthritic change, the prognosis is excellent. If mild to moderate bone spur formation has developed the prognosis is still very good but there is a greater chance of recurrence. If there are diffuse bony changes and osteoarthritis of the ankle joint is moderate to severe, prognosis is guarded. Sometimes a large spur or soft tissue thickening is present even with these advanced changes and the prognosis can be good.